N.B. 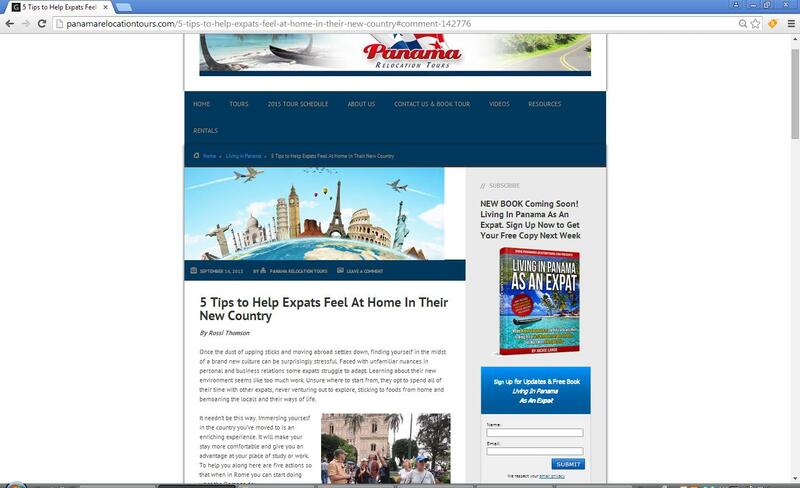 This article highlights practices of content stealing and modifying used by a company called Panama Relocation Tours. Screenshots of their website and emails sent by the company to me are provided to corroborate my statements below. It was 7 o’clock in the evening and I was busy cooking dinner and simultaneously looking after my child. My husband was due home within a few minutes and, knowing that he had had a stressful day at work, I wanted to make sure that at least he had a relaxing evening with his family at home. Alarm bells went off in my head. I dropped everything and ran to the computer. Someone had effectively informed me that they had re-posted one of my articles without obtaining my authorisation first. Yes, they were asking me to give them permission, but in the meantime, they had gone ahead, copied my article and posted it on their website. This is such a big ‘No! No!’. First, it is against copyright and authorship laws to simply pick a text authored by somebody else and, without asking, to post it on your website. Second, it defies common courtesy. Not to mention the rather important issue of Google rules against duplicate content where the ranking of a blog in the search results can suffer significantly if its content is duplicated on other websites. Considering all this, it is not surprising that I was incensed. Now, also think of this. I invest a lot of time and effort in my articles. I develop original content both in words and images which reflect my experience as a linguist, journalist, expat, traveler and person! I spend long hours in front of the computer screen building a portfolio in order to get editors and media outlets interested in my writing. This is time I could spend with my child or with my husband or I could simply spend sleeping more, going out more or simply watching more funny videos online. The last thing I need is someone simply helping themselves to my hard work and thinking that by telling me that they ‘love my blog’, somehow this will make it OK. It doesn’t! Then, I left a comment along the same lines on the company’s Facebook page and posted a comment underneath my article (re-posted without my permission) on their website asking for its immediate removal. 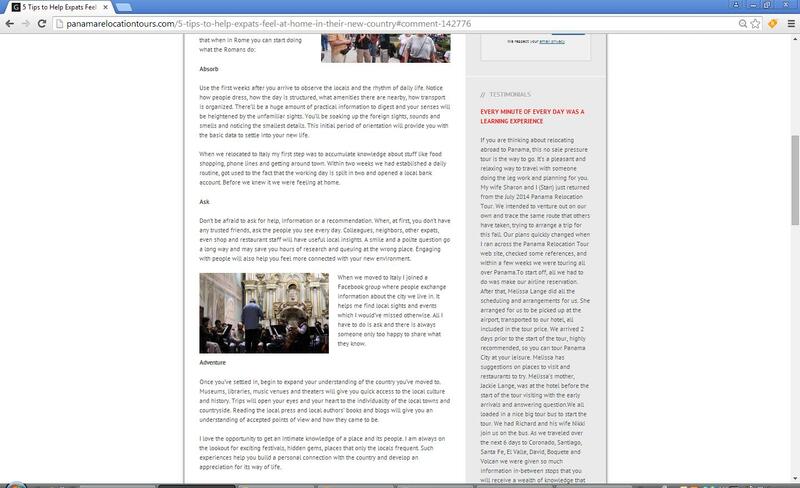 By the way, here are the screenshots of my article copied and pasted word for word on the website of said company. Please, pay particular attention to the URL in the browser’s address bar. I will explain in a few moments why this is so important. So, after I sent my very clear response, I got this email back. The tone was rather irritated and I was threatened that I would loose on traffic to my blog. Plus, it seemed, just because another site had stolen my content first, somehow it was considered OK to steal it again without asking me. Look, there is a thing called: ‘Ignorantia juris non excusat‘, which in English means: ‘Ignorance of the law excuses no man’. I think this is self-explanatory. Let’s not forget about common courtesy. Would you go into someone’s house, pinch their TV, put it in your own house and when they remonstrate with you, would you become irritable and threatening and claim that you only put the TV in your house, so they ‘could see where it would be used’?! I am sure some people would do this, but we have a special name for them, which is ‘thieves’. Intellectual property is no different to material property. It belongs to someone, who has invested their time, their intelligence and their experience to create it from scratch, so don’t go around threatening them when they tell you not to infringe on their property. And now you would think this would be the end of the story! I told them what I thought of them and they removed my content from their website. The world is cute and fabulous again. Because a couple of hours after this email exchange took place, the same company published my article again on their website. This time though they had removed my byline and had gone to the effort to re-write it in places to make it country-specific, but as a whole it is the same concept and the same article, still stolen. And now, let me tell you something else. I wrote my article on the 10th May 2015 for the Expat section of a large British newspaper – The Telegraph. It was posted on their website on 21st August 2015, at 9:53 am BST under the title ‘Five Ways To Feel At Home In the Country You’Ve Moved To‘. To this date it has been shared 264 times on social media. 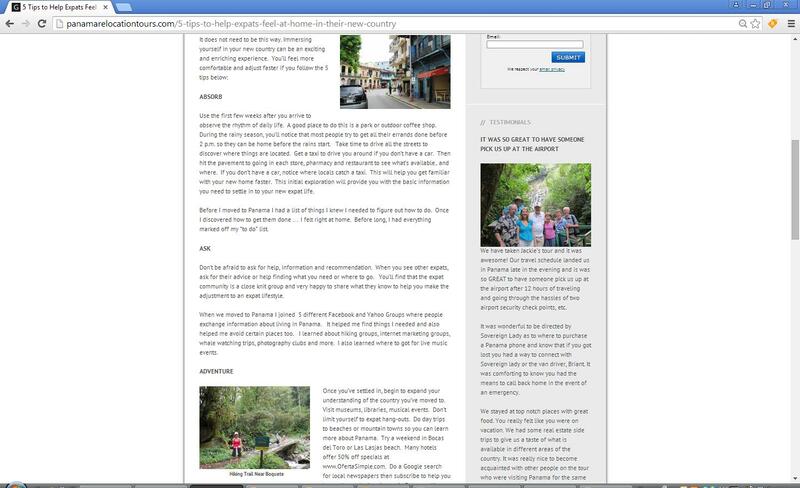 This is the article which first Cuenca High Life’s website and then the above mentioned Panama Relocation Tours had posted without my or the newspaper’s permission on their respective websites word for word and only slightly tweaking the title to read ‘Five Tips to Help Expats Feel At Home In Their Adopted Country’. Everything else was copied and pasted verbatim, including my byline and my attribution at the end of the article. So, they basically stole not just from me, but from a very large newspaper, too. 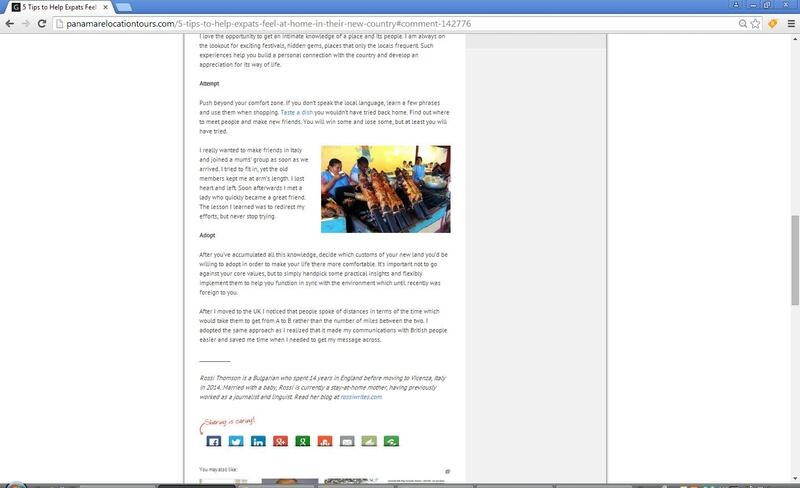 No, let’s get back to what Panama Relocation Tours did after they had removed my original article from their website. As I told you above, they re-posted it! They sat down and re-wrote it here and there, exchanged the examples I had given in the articles with their own, but otherwise it is the same idea, the same structure and the same emotion I had invested in it. 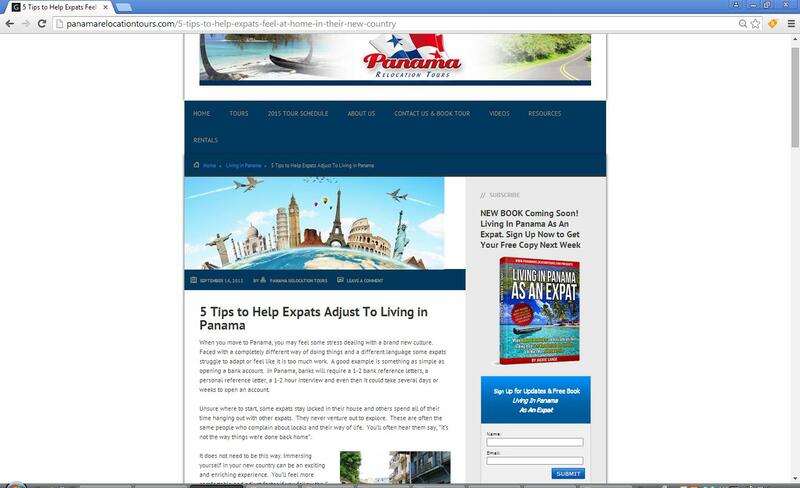 Just one example: in the original article I had used five words, all starting with ‘A’ to describe the stages through which an expat should go through in order to adapt themselves to the country they had moved to. These were: Absorb, Act, Adventure, Attempt and Adopt. It is this A-structure that made the article unique, streamlined and easy to read and understand. Now, look below. Do you see something identical?! Or, in other words: The practice of taking someone else’s work or ideas and passing them on as one’s own. 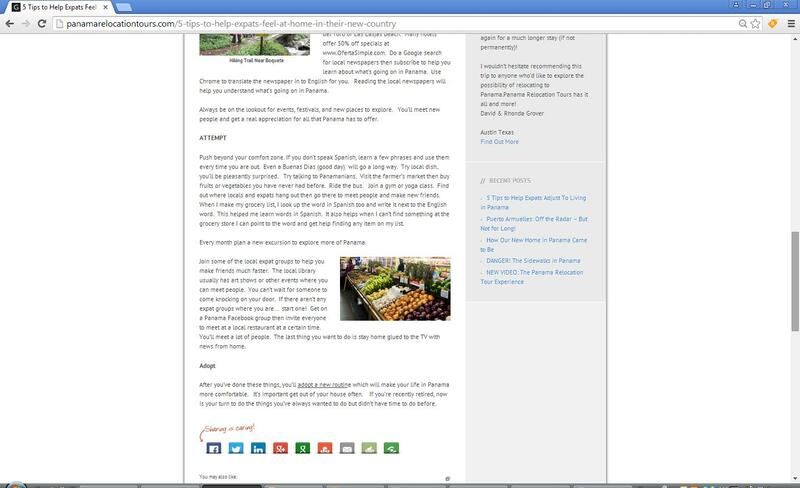 In the end, please, note the URL in the address bar of the re-worked article. It is absolutely the same as the one of the copied word for word article which was removed by the infringing company after I requested them to do it. In other words, when they realised that they had to remove my original copy, they simply took it offline, but didn’t delete it. They went into their blog editor and re-wrote my article, but didn’t or couldn’t update the link to reflect the new title they had come up with, which is yet another clear indication that they stole from me. – I have already informed The Telegraph that an article which I had written and they had posted on their website had been stolen by two different companies. – I will inform the Web Host of the infringing companies that they are using copied/plagiarised content on their websites. – I will explore Google Webmaster Tools with view of submitting a complaint against the websites of the infringing companies. – Remove any and all texts which are my copyright. This includes any and all word for word, re-written and inspired by texts. – Apologise! Via email, on Facebook, on Twitter, it doesn’t really matter. What matters is that they owe up to their harmful behaviour and take responsibility for it. – Please, help me spread the word. Share this article on any and all social media channels you can think of. Copying/pasting and plagiarising content is the bane of internet. Support writers, even small-scale ones like me! Thank you for your time and for your support!